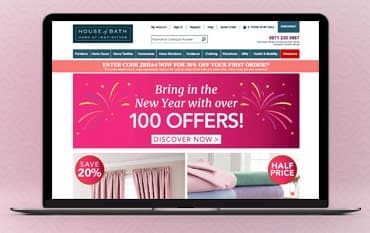 Where do I use my House of Bath voucher code? Find the best quality homeware at House of Bath. This premium home shopping store offers wonderful designs of furniture and other home furnishings that will help you create a variety of stylish interiors in your home. From furniture to home decor, to outdoor products and clothing, you can find so much for you and your home at House of Bath. All their products are incredibly high quality and on trend, brought to you at affordable prices, allowing you to fill your home with the very best accessories, for less. House of Bath was founded in 1998 and is now a leading homeware supplier. In addition to their range of stylish home furnishings, textiles and accessories, House of Bath is the place to find solutions to all the everyday problems in your home. Here you will find storage solutions, cleaning solutions, pest deterrents. home security products, products to deal with pet waste, items to make travel more comfortable, furniture solutions and DIY products. Their value for money products will be quickly and conveniently delivered to your home. Bed linen from House of Bath comes in both contemporary and traditional designs and in colours and styles to suit all decors. They offer quality bedding sets, sheets, pillowcases, blankets, duvets and pillows, blankets and mattress enhancers and protectors. House of Bath stock bed linen from many leading brands such as Christie, Catherine Lansfield, Sanderson, V7A, Vantona and more. So if you are looking for sheets and pillowcases or a full duvet set in plains, florals, stripes or geometric patterns, you are sure to find just what you need to update your bedroom here. You'll find many beautiful bedspreads on offer at House of Bath. Full Bedspread Sets, which also include matching pillow shams are available in a variety of styles including quilted, patchwork and candlewick. If you don't want the full set then perhaps you would like one of the many attractive bedspreads or throws on offer including fitted bedspreads, quilted and candlewick bedspreads and throws in a great choice of colours and designs. Whatever your preference, you are certain to find the perfect finishing touch to your bed here. Part of the J D Williams catalogue group, House Of Bath is one of the UK's leading homewares retailers offering stylish, unique and ‘hard to find’ products and solutions for the home. Shop here for bedding and towels, furniture, tableware, lighting, home electrical appliances, garden furniture and accessories, gifts and clothing. Their products offer excellent value for money so you can enhance your living space without breaking the bank.